R‌etired school teacher Melanie Dewey wanted to serve the church, but she knew ordained ministry was not for her. Instead, she became a deaconess at her home church, Tulsa-Centenary. She learned about the United Methodist lay program from a pamphlet she received at Mission U four years ago. It offered her "the way I wanted to minister without the restriction of being ordained," she said. She preferred to choose her own form of ministry and location, rather than itinerate. "I knew exactly where I wanted to be and what I wanted to do." Deaconess training is a two- to three-year process, she said. It involved seminary classwork. She was consecrated at the General Conference in Oregon in mid-May, and Bishop Robert Hayes confirmed her later that month at Oklahoma’s Annual Conference. She is one of five active deaconesses in the Oklahoma Conference. Dewey’s career experience has been as a special education teacher. After retiring, she worked at a nonprofit that offered counseling and medication therapy for children and adults, including victims of abuse, street people, and people going through divorces. Now at Centenary UMC, her role is as a "community involvement coordinator." She helps with RISE, a program for developmentally delayed adults. Clients work in the church’s food pantry and clothing closet and do other jobs at the church. For example, they package bread donated from Panera, and then hungry families pick up what they need. Dewey also is involved with outreach into two neighborhoods, Brady Heights and Owen Park. Centenary is in a "unique area" of Tulsa, she said. The church is close to the John 3:16 Mission, a correctional facility, the Salvation Army, and a day center for the homeless. Dewey described John, her husband of 40 years, as her "number-one" supporter. They have three grown children and four grandchildren. Deaconess Melanie Dewey arranges the clothing closet at Tulsa-Centenary UMC. 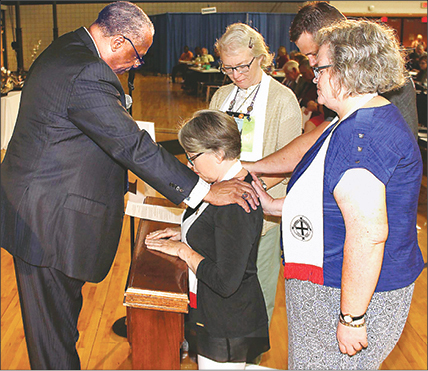 Bishop Robert Hayes Jr. confirms Melanie Dewey, kneeling, at Annual Conference. Jerrie Lindsey and Shelly Owen also are shown.